Total Hip replacement, or arthroplasty, is a surgical procedure in which the diseased parts of the hip joint are removed and replaced with new, artificial parts. These artificial parts are called the prosthesis. The goals of hip replacement surgery include increasing mobility, improving the function of the hip joint and relieving pain. What are the common causes for which a total hip replacement is required? Any condition or disease which causes arthritis of hip joint may necessitate a total hip replacement. Some of the common causes due to which you may get arthritis of hip are injury, avascular necrosis (death of bone caused by insufficient blood supply), infection, inflammatory disease like Rheumatoid Arthritis etc. In all these conditions, the joint surface (cartilage) wears out. The joint surface is covered by a smooth articular surface that allows pain free movement in the joint. When the articular cartilage wears out, the bone ends rub on one another and cause pain. However, in majority of the patients, no definite cause of arthritis can be found when it is called primary osteoarthritis. In early arthritis, when the pain is not severe, there is no night pain or restriction of your routine daily activities, simple measures like reduction of body weight, use of a walking aid, gentle exercise of hip to keep the muscles around the hip supple and use of painkillers can be implemented. Though, arthritis in most of the patients is progressive, these simple measures can help postpone the surgery. This is particularly important in relatively younger patients where hip replacement should be deferred as long as possible as the life expectancy of an artificial hip is about 12-15 years. When should I consider undergoing a Total Hip Replacement? Once you have arthritis which has not responded to conservative (non-operative) treatment, you may well be a candidate for total hip replacement surgery. You should consider a THR when you have. 1) Pain not responding to analgesics. 2) Restriction of activities of daily living including your leisure activities, sport or work. 3) Pain keeping you awake at night. 4) Stiffness in the hip making mobility difficult. 5) X-rays of hip showing arthritis. 1) Relief from rest pain and night pain. 2) Increased mobility and movement. 4) Improved quality of life and ability to return to normal activities. What part of the hip is replaced? The head (or ball) of the patient's femur and the neck of the femur (the thigh bone) are removed. 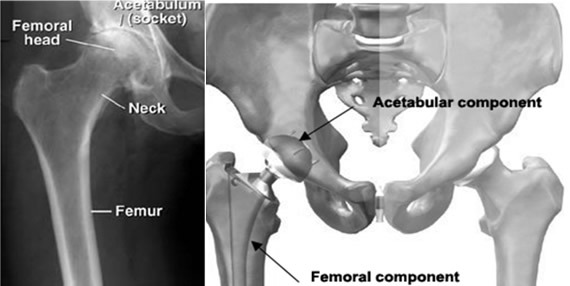 An acetabular component is placed into the damaged socket. This component can be an all plastic cup or a metal "cup" lined with a polyethylene shell (a hard plastic-like inner lining). The ball of the femoral implant (or stem) fits into this cup, creating a new, movable joint. Today, both cementless (also called uncemented and porous-coated) and cemented hip replacements offer patients effective, long-term relief. As every patient’s condition is unique, the advantages and disadvantages should be taken into consideration before making the decision. Cemented replacements are usually used for older, less active people and people with weak bones(osteoporosis), while uncemented replacements are more frequently used for younger, more active people. The studies have demonstrated comparable rates of success of both cemented and uncemented prostheses. The primary disadvantage of an uncemented prosthesis is the extended recovery period, as it takes a long time for the natural bone to grow and attach to the prosthesis during which period, the patient may experience some thigh pain. A patient with uncemented replacements, therefore, is required to limit activities for up to 3 months to protect the hip joint. What does Total Hip Replacement Surgery involve? Prior to surgery routine blood tests and other investigations are carried out along with examination by a physician to make sure you are fit to undergo surgery. In a standard hip replacement, a 6- to 8-inch long incision is made over the side of the hip through the muscles and diseased bone tissue. Cartilage from the hip joint is removed and the healthy parts of the joint are left intact. The head of the femur and acetabulum with new, artificial parts are then replaced. Cemented parts are fixed with the healthy bone with a special glue or cement. Hip replacement using these parts is referred to as a “cemented” total hip replacement. Uncemented parts rely on a process called biologic fixation, which holds them in place and your own bone grows into the pores and hold the new parts in place. Sometimes a cemented femur part and uncemented acetabular part are also used. This combination is referred to as a hybrid replacement. Usually, the patient does not spend more than5 to 7 days in the hospital after hip replacement surgery. Full recovery from the surgery takes about 3 to 6 months, depending on the type of surgery, your overall health, and the success of your rehabilitation. What postoperative precautions should be taken? Avoid the combined movement of bending your hip and turning your foot in. This can cause dislocation. Other precautions to avoid dislocation are. 1) You should sleep with a pillow between your legs for 6 weeks. 2) Avoid crossing your legs and bending your hip past a right angle. 4) Avoid bending over to pick things up. 5) Elevated toilet seat is helpful. 6) You can take bath after the wound has healed. If you are having any procedures such as dental work or any other surgery, you should take antibiotics before and after to prevent infection in your new prosthesis. What are the potential risks and complications of a total hip replacement? As with any other major surgery, there are potential risks involved in undertaking a total hip replacement. These can be either medical (general) or specific to the hip. Medical Complications include allergic reactions to medications, Heart attacks, strokes, kidney failure, pneumonia, bladder infections etc. Serious medical problems can lead to ongoing health concerns, prolonged hospitalization or rarely death. 1) Infection: Infection can occur with any operation. In the hip, this can be superficial or deep. Infection rates are approximately 1% and if it occurs it can be treated with antibiotics but may require further surgery. Very rarely your hip may need to be removed to eradicate infection. 2) Dislocation: This means the hip comes out of its socket. Because the artificial ball and socket are smaller than the normal ones, the ball can become dislodged from the socket if the hip is placed in certain positions. The most dangerous position usually is pulling the knees up to the chest. If a dislocation occurs, it needs to be put back into place with an anaesthetic. Rarely this becomes a recurrent problem needing further surgery. 3) Blood clots (Deep Venous Thrombosis): These can form in the calf muscles and can travel to the lung (Pulmonary embolism). These can occasionally be serious and even life threatening. 4) Leg length inequality: It is very difficult to make the leg exactly the same length as the other one. Occasionally the leg is deliberately lengthened to make the hip stable during surgery. There are some occasions when it is simply not possible to match the leg lengths. All leg length inequalities can be treated by a simple shoe raise on the shorter side. 5) Wear: All joints eventually wear out. The more active you are, the quicker this will occur. In general 80-90% of hip replacements survive 15-20 years. 6) Failure to relieve pain. 7) Unsightly or thickened scar. 8) Limp due to muscle weakness. 9) Fractures (break) of the femur (thigh bone) or pelvis (hipbone). Hip replacement is one of the most successful orthopaedic surgeries performed. More than 80 percent of people who have hip replacement surgery will never need to replace an artificial joint. However, because more people are having hip replacements at a younger age and wearing away of the joint surface becomes a problem after 15 to 20 years, replacement of an artificial joint, which is also known as revision surgery, is becoming more common. It is more difficult than first-time hip replacement surgery and the outcome is generally not as good as the primary hip replacement. Proper exercise can reduce stiffness and increase flexibility and muscle strength. Exercises should begin with safe range-of-motion activities and muscle-strengthening exercises. High-impact activities, such as jogging and tennis should be avoided as they can damage the new hip or cause loosening of its parts. Some recommended exercises are walking, stationary bicycling and swimming. These exercises can increase muscle strength and cardiovascular fitness without injuring the new hip. Is Hip Resurfacing better than a Total Hip Replacement? Although it is becoming a more popular treatment option, hip resurfacing is not appropriate for all patients with hip arthritis. The best candidates for hip resurfacing are males under the age of 55. Generally, for older patients, conventional hip replacement surgery is a better choice. There are definite benefits and risks associated with hip resurfacing. 1) Femoral head is preserved. 2) Femoral canal is preserved and no associated femoral bone loss with future revision. 3) Larger size of implant "ball" reduces the risk of dislocation. 4) Resurfacing patients are more likely to recover a natural gait compared to total hip replacement patients. 1) Lack of long-term track record. Current device has only been used for about 10 years. 2) Despite known low wear rate, longevity and long term effects of wear debris are unknown.